Blistex is known for creating products that look after and care for our lips - so I had very high expectations when I first saw this product! The cream comes in a 5g tube, so is a good size to pop in your bag or your purse for when you're on the go. 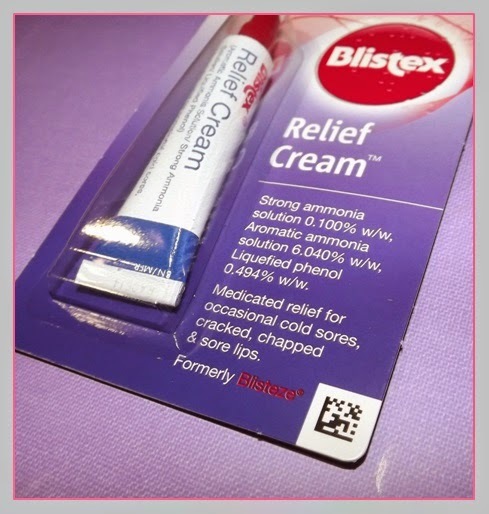 The packaging claims that the cream provides relief for occasional cold sores, cracked, chapped and sore lips - so I thought it would be a good idea to check out the ingredients to see how it could do this. The three that stood out to me were: camphor, lanolin and peppermint oil. Camphor has many medicinal uses: it's found in anti-itch gels as well as vaporub! It's readily absorbed into our skin and produces a cooling sensation. As well as this, it acts as a slight anesthetic and an antimicrobial substance - making it ideal to treat sore lips. Lanolin is a natural waxy substance that helps to lubricate your lips - giving you a protective layer. Finally, peppermint oil gives you a feel of freshness and also, like camphor, gives a cooling sensation - which is great if your lips are slightly inflamed from the sores. In terms of how you use it, you're supposed to gently apply every hour when your symptoms arise. I tested this out for the first time one evening when I'd been out amongst the harsh winds and cold all day. I'd forgotten to take a lip balm with me that day, so my lips, which were already chapped, felt even more dried out and they'd cracked at the corners. It was really painful everytime I opened my mouth! I squeezed out a tiny amount of the cream, which is a pale whiteish-yellowish colour, and rubbed it all over my lips. A little definitely goes a long way with this product. It's so silky smooth - really easy to apply. The cream is completely transparent once rubbed in, so if you're someone that likes applying lipsticks etc. then don't worry! Immediately after applying, I felt a tingling in my lips. The tingling accompanied a cooling sensation, which was so soothing on the cracked areas which were the most sore. I know some people don't like the tingling that you get with lip balms like Carmex - but the tingling with the Blistex Relief Cream is not as intense. It's subtle, but more refreshing than anything. You can definitely smell the peppermint oil too - which I love! The packaging says to reapply every hour, but I found it so effective that I didn't have to top up as often as this. I got into the habit of putting it on right before bed so that the product could work overnight without being interupted by me eating, drinking etc. By the morning, I could still feel some of the cream on my lips which has just prevented my lips from drying out overnight. I love using the cream in this way - as an overnight lip treatment. It leaves my lips feeling so soft! I can definitely vouch for the relief cream in helping to remedy cracked and chapped lips. Touch wood, I've never actually had a cold sore - so I'm unable to review it's ability to treat those, but I would be confident in it's ability to help soothe and protect the skin. 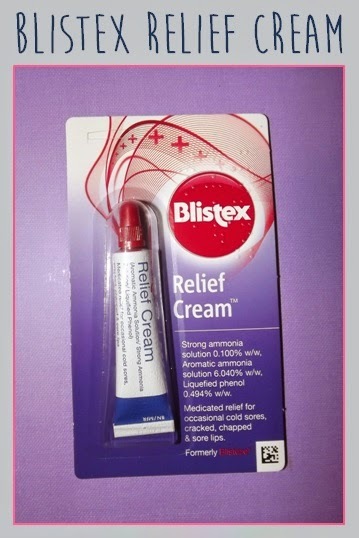 This cream has definitely been my winter miracle-worker - even if you own an abundance of lip balms, like I do, I would still highly recommend getting yourself a medicated lip cream, like the Blistex Relief Cream, for those situations where your lips need a bit more TLC. The Blistex range is available from all leading retailers and pharmacies. If you want to find out more then check out their website: here.